Scania Malaysia sees growth potential in Sarawak due to the improvement in infrastructure, especially with the on-going Pan Borneo Highway project that will improve connectivity between towns in Sarawak and lead to an increase in the movement of goods and people within the state. As such, Scania Malaysia is strengthening its services and support infrastructure in Sarawak to ensure that it is capable of supporting its customers in the state. At the same time, Scania is ensuring that drivers are trained to achieve the best fuel economy, safety and performance. 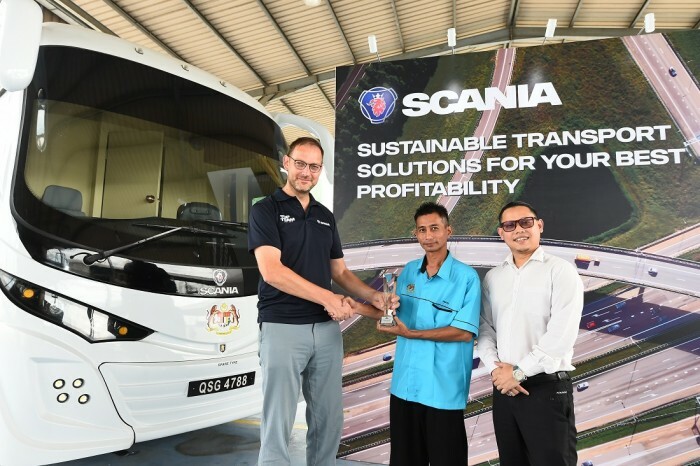 To encourage efficient driving, Scania Malaysia had been holding the Scania Fleet Management System (FMS) competition. In Sarawak, the Scania FMS award was presented to the Bintulu High Court – represented by Magistrate Muhammad Hafiz Mohd Noor and Mohd Faizal Mohd Rasul, at the Scania Sales and Service Centre in Bintulu. Why the Bintulu High Court? Because it uses a Scania bus as a mobile court room to cover the rural areas. The Scania FMS gathers data on driver and vehicle performance and is a total solutions approach offered by Scania for its customers to achieve the best profitability in their business. The FMS connects the vehicle to the operator’s office and helps identify and use the key details such as vehicle data, fuel consumption, fleet position and driver performance (coasting, heavy braking, speeding or idling). Used together with the Scania Driver Services, which consists of Driver Training & Driver Coaching, this information will help give operators a clearer understanding of their fleet performance and costs. Making use of the information available, the fleet operators thus can increase the productivity of the fleet, achieve fuel efficiency and eventually reduce the cost of operations. 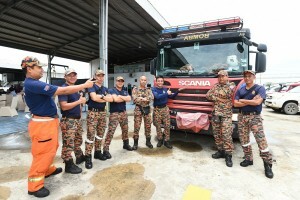 The Bintulu Fire and Rescue Department team and their Scania truck at the Scania (Malaysia) Bintulu centre. The Scania Sales and Service Centre in Bintulu is equipped with eight workshop bays and manned by nine staff. 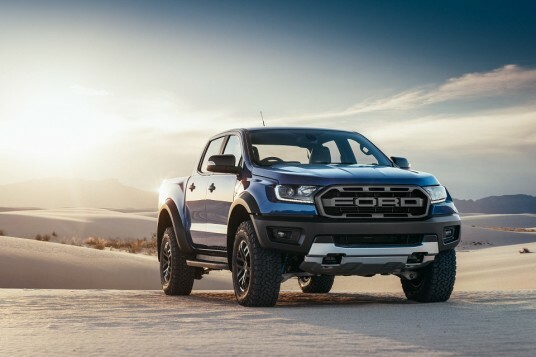 It is responsible for truck, bus, coach and engine sales, while offering workshop services, contract services and financial services, as well as driver and connected services. Scania also has a mobile workshop based in Kuching that is able to offer a full spectrum of maintenance facilities for its vehicles as it is equipped like a full-fledged Scania workshop, including special tools, work bench, air compressor, waste oil disposal, full tool box, hoists and lifting equipment. “Scania places tremendous effort on the after-sales service support for our customers and our Bintulu workshop is strategically located and equipped to offer top quality service and support for our customers,” said Scania Southeast Asia’s Presales Director Tom Kuiphuis. Kuiphuis said Scania’s aim is to help customers achieve maximum uptime and optimum fuel economy for their vehicles, while maintaining the best total operating economy. Additionally, Scania has a 24/7 Scania Assistance standby service van based in Bintulu for roadside assistance anywhere in the state, which is manned by highly-skilled and experienced personnel to ensure that vehicles always operate at maximum uptime. Complementing that is the Scania repair and maintenance contracts that help to ensure that the vehicles or engines are in the safest possible hands and everything from powertrain protection to full bumper-to-bumper coverage or bodywork and auxiliary equipment are all covered. The repair and maintenance contracts offer early detection of deviations to secure product performance and availability to avoid unplanned interruptions to daily operations. It also provides access to the right skill set to care for technically advanced vehicles, secured product performance by always using Scania Parts, roadside assistance 24/7 and a plannable cash flow due to known cost through the entire contract period. Further, Scania offers flexible maintenance plans that are tailored to fit the operational needs of customers with vehicles spending less time idle at the workshop based on when the operating data indicates that maintenance is needed. For fleet owners, Scania Fleet Care takes care of the whole fleet and makes sure each vehicle is performing at peak condition and maintain maximum uptime, all under a dedicated Fleet Manager for central co-ordination and service planning.